In fact as reported by previous studies, the interaction between MRs of pharmaceutical companies and doctors are highly ubiquitous. The reported studies have proved that propagative activities by MR of the pharmaceutical companies can impact the prescribing pattern of doctors. Because of this the interaction between doctors and the pharmaceutical industry is coming under increasing exploration., The probability that drug companies might be exercising too much influence on clinical decision making of doctors has led to many concerns. The primary objective was to assess the attitude of the doctors toward the interaction with the MRs of the pharmaceutical company. The secondary objective was to assess the awareness of the doctors about regulations governing their interaction with the pharmaceutical company. This study was conducted at Dhanalakshmi Srinivasan Medical College and Hospital (DSMCH), a Tertiary Care Hospital in Perambalur, Tamil Nadu, India. The study was approved by the Institutional Ethics Committee of DSMCH, Perambalur. The study period was between June and September 2014. A cross-sectional study was carried out using a pretested questionnaire. The questionnaire was designed to assess the attitude of the doctors toward the interaction with MRs and to assess the awareness of the doctors about regulations governing their interaction with the pharmaceutical company [Appendix 1]. Pilot testing of the questionnaire was done randomly on 10 doctors of the institute. The questionnaire was finalized after ambiguous, and unsuitable questions were modified based on the result of the pretest. The doctors working in the DSMCH, Perambalur (Tamil Nadu) during the study period were included. Only those who gave their consent to participate were included in the study. About 100 pretested questionnaires [Appendix 1] were distributed among the healthcare professionals. A time of 1-day was given for the collection of the anonymously filled forms. Simple random sampling was followed while distributing the questionnaire to the doctors. The total number of doctors working in the hospital at the time of the study (population size) was approximately 135. The margin of error was 5% and confidence level was 95%. The expected frequency value of 50% was used as it produces largest sample size. Putting the values of population size, the margin of error, confidence interval and expected frequency value or response distribution, the approximate sample size was found to be 100 approximately. The data were analyzed using the Statistical Package for Social Sciences Statistical Software, version 16, IBM Corporation (Armonk, New York, U.S). One sample t-test between percents was used to compare responses. One sample t-test between percents was performed to determine whether respondents were more likely to prefer one alternative or another. P <0.05 were considered to indicate statistical significance. A total of 100 questionnaires were distributed among the doctors and 81 responded (response rate = 81%). [Table 1] shows demographic details. 37.0% doctors have stated that they interact with MR of pharmaceutical companies at least once a week, 25.9% doctors have stated that they interact with MR of pharmaceutical companies at least twice a month, 16% doctors have stated that they interact with MRs 2–3 times/week, 12.3% doctors stated that they interact with MR rarely, and 8.6% doctors stated that they interacted with MRs daily. 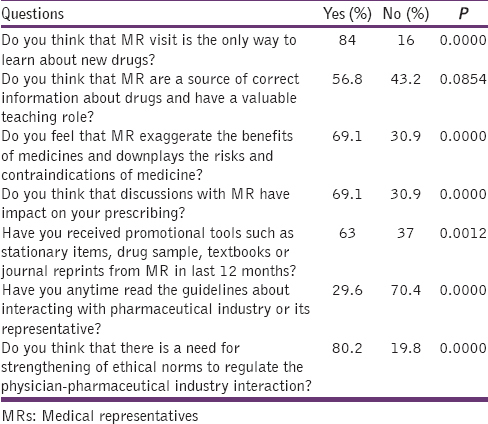 84% doctors do not think that MR visit is the only way to learn about new drugs but 16% doctors think that MR visit is the only way to learn about new drugs (P = 0.0000). 56.8% doctors think that MR are a source of correct information about drugs and have a valuable teaching role but 43.2% doctors do not think that MR are a source of correct information about drugs and have a valuable teaching role. 69.1% feel that MR exaggerate the benefits of medicines and downplays the risks and contraindications of medicine, whereas 30.9% doctors do not think that MR exaggerate the benefits of medicines and downplays the risks and contraindications of medicine (P = 0.0000). 69.1% doctors think that discussions with MR have an impact on their prescribing, but 30.9% do not think that discussions with MR have an impact on their prescribing (P = 0.0000). 63% doctors stated that they had received promotional tools such as stationery items, drug sample, textbooks, or journal reprints from MR in last 12 months but 37% doctors said that they had not received promotional tools such as stationery items, drug sample, textbooks or journal reprints from MR in last 12 months (P = 0.0012). Only 29.6% doctors stated that they have read the guidelines about interacting with pharmaceutical industry or its representative whereas 70.4% doctors stated that they had not read the guidelines about interacting with pharmaceutical industry or its representative (P = 0.0000). 58% doctors think that it is unethical to accept gifts, travel facility, hospitality, monitory grant from pharmaceutical industry or its representative to doctors whereas 42% doctors think that it is ethical to accept gifts, travel facility, hospitality, monitory grant from pharmaceutical industry or its representative to doctors (P = 0.0434). 71.6% doctors think that it is unethical to endorse any drug or drug product of the pharmaceutical industry publically whereas 28.4% doctors think that it is ethical to endorse any drug or drug product of the pharmaceutical industry publically (P = 0.0000). 80.2% doctors think that there is a need for strengthening of ethical norms to regulate the physician-pharmaceutical industry interaction but 19.8% doctors do not think that there is a need for strengthening of ethical norms to regulate the physician-pharmaceutical industry interaction (P = 0.0000). [Table 2],[Table 3],[Table 4] show the abovementioned details. 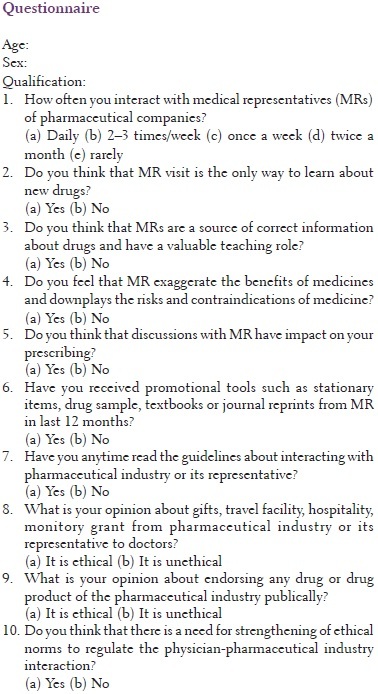 Table 2: Response of the doctors on frequency of interaction with MRs of pharmaceutical companies? 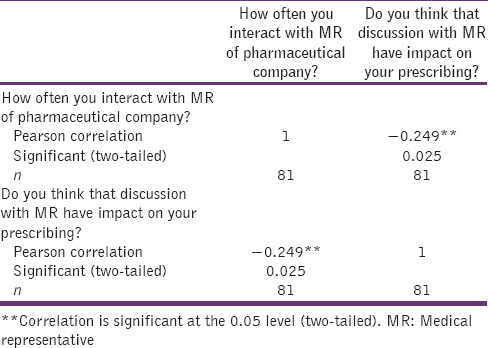 The correlation between the interaction of doctors with MR of pharmaceutical company and impact on their prescribing was analyzed by using Pearson's correlation coefficient. The strength of correlation between two variables was found to be weak negative. The correlation was significant at the 0.05 level (two-tailed) (r = −0.249, n = 81, P = 0.025) [Table 5]. It may not be feasible to completely do away with industry interaction. Moreover, the majority of the doctors said that there is there is a need for strengthening of ethical norms to regulate the physician-pharmaceutical industry interaction. So, rather than forbidding any connection between doctors and industry, it is better to establish ethical guidelines for industry sponsorship of conferences, research, and gifts to doctors. In December 2009, MCI rectified the Code of Medical Ethics, which now recommends stringent actions against medical professionals benefitting from pharmaceutical industries. It categorically states that a medical practitioner shall not receive any gift, travel facilities, hospitality from industry. The regulations further provide that a medical practitioner shall not individually receive any cash or monetary grants from industry. The medical practitioners are also forbidden from supporting any drug or product of the industry publically. The regulations, however permit funding for medical research, study, etc., provided it is received by the medical practitioner through approved institution(s). The Indian Pharmaceutical Industry Associations-Indian Drug Manufacturers' Association and Organization of Pharmaceutical Producers of India - have their own guidelines which emphasize on the ethical promotion of medicines to healthcare professionals. But, 68.3% doctors have not read the guidelines about interacting with the pharmaceutical industry or its representative. The major limitation of this study was the essentially small number of participants. Because of the small sample size, the result of the study cannot be generalized to the whole population. In addition, some other factors that are associated with self-reporting studies such as accuracy of recall, personal bias could also have affected the results of this study in some ways. The majority of the doctors said that MR influences their prescribing but at the same time majority of the doctor said that MR exaggerates the benefits of medicines and downplays the risks and contraindications of medicine. Rather than forbidding any connection between doctors and industry, it is better to establish ethical guidelines. The MCI code is a step in the right direction, but the majority of doctors in this study have not read the guidelines about interacting with the pharmaceutical industry or its representative. I gratefully acknowledge the help of my colleagues in the Department of Pharmacology, DSMCH, Siruvachur, Perambalur - 621 212, Tamil Nadu, India. Morgan MA, Dana J, Loewenstein G, Zinberg S, Schulkin J. Interactions of doctors with the pharmaceutical industry. J Med Ethics 2006;32:559-63. Alssageer MA, Kowalski SR. A survey of pharmaceutical company representative interactions with doctors in Libya. Libyan J Med 2012;7:18556. Wazana A. Physicians and the pharmaceutical industry-Is a gift ever just a gift? JAMA 2000;283:373-80. Zipkin DA, Steinman MA. Interactions between pharmaceutical representatives and doctors in training. A thematic review. J Gen Intern Med 2005;20:777-86. Balhara YP, Mathur S, Anand N. A study of attitude and knowledge of the psychiatry resident doctors toward clinician-pharmaceutical industry interaction. Indian J Psychol Med 2012;34:61-5. Verma SK. Physician pharmaceutical industry interaction: Changing dimensions and ethics. Indian Pediatr 2004;41:29-36. Chatterjee C, Srinivasan V. Ethical issues in health care sector in India. IIMB Manage Rev 2013;25:49-62. Bhatt A. A new challenge for Indian physicians and healthcare industry: Decoding the MCI code of professional conduct. J Postgrad Med 2010;56:1-2. Bhatt AD. Drug promotion and doctor: A relationship under change? J Postgrad Med 1993;39:120-3. Bal A. Can the medical profession and the pharmaceutical industry work ethically for better health care? Indian J Med Ethics 2004;1:17. Roy N. Who rules the great Indian drug bazaar? Indian J Med Ethics 2004;1:2-3. Anand AC. The pharmaceutical industry: Our 'silent' partner in the practice of medicine. Natl Med J India 2000;13:319-21. Kalantri SP. Drug industry and medical conferences. Indian J Anaesth 2004;48:28-30. Katz D, Caplan AL, Merz JF. All gifts large and small: Toward an understanding of the ethics of pharmaceutical industry gift-giving. Am J Bioeth 2003;3:39-46. Grande D. Limiting the influence of pharmaceutical industry gifts on physicians: Self-regulation or government intervention? J Gen Intern Med 2010;25:79-83. Green MJ, Masters R, James B, Simmons B, Lehman E. Do gifts from the pharmaceutical industry affect trust in physicians? Fam Med 2012;44:325-31. Chew LD, O'Young TS, Hazlet TK, Bradley KA, Maynard C, Lessler DS. A physician survey of the effect of drug sample availability on physicians' behavior. J Gen Intern Med 2000;15:478-83. Alssageer MA, Kowalski SR. What do Libyan doctors perceive as the benefits, ethical issues and influences of their interactions with pharmaceutical company representatives? Pan Afr Med J 2013;14:132. Alssageer MA, Kowalski SR. Doctors' opinions of information provided by Libyan pharmaceutical company representatives. Libyan J Med 2012;7. Othman N, Vitry AI, Roughead EE, Ismail SB, Omar K. Medicines information provided by pharmaceutical representatives: A comparative study in Australia and Malaysia. BMC Public Health 2010;10:743. Chressanthis GA, Khedkar P, Jain N, Poddar P, Seiders MG. Can access limits on sales representatives to physicians affect clinical prescription decisions? A study of recent events with diabetes and lipid drugs. J Clin Hypertens (Greenwich) 2012;14:435-46. Lieb K, Brandtönies S. A survey of German physicians in private practice about contacts with pharmaceutical sales representatives. Dtsch Arztebl Int 2010;107:392-8. Lieb K, Scheurich A. Contact between doctors and the pharmaceutical industry, their perceptions, and the effects on prescribing habits. PLoS One 2014;9:e110130.